Un jardín en clima subtropical húmedo: Love at first sight! these roses are very pretty, but they don't make your roses look less beautiful!! Thank you for your comment. All the photos of flowers are from Italy. :) The plants are delicate beauties that wouldn't survive in our harsh climate. Sara, Happy easter for you too! Soon your garden will be full of Lupins and hope to see many pictures of them for I couldn't grow them here to save my life! While my own plant obsessions don't center on roses, MDN, I understand! Best wishes for a wonderful Easter weekend. Thanks Kris, happy easter for you too! I can totally understand that you like to grow roses! Also in Germany it is not possible to cultivate all David Austin roses. Many of them are not frost-resistent. By the way, how did people found out that your name is Marcelo? Sigrid, yes that's my name, some blogs don't accept comments from google so I left my name there. As for these roses, they are only sold as cut flowers and can only be grown under license, seemingly as many florist roses they need a very controlled enviroment in greenhouses to grow, they are not garden roses but I wish they were, they are gorgeous! Happy easter! I used to love going to Ludwig's Roses and collecting plants for that garden in Porterville. But here - I enjoy roses on garden blogs - except for the indestructible Iceberg - which smells delicious, and I can pick it. Hola MDN, me encantan los rosales David Austin, todos son preciosos. Besos. Lola, la verdad es que los rosales de David Austin son hermosos, los admiré durante mucho tiempo en fotos y recién hace un mes pude finalmente conseguir algunos, espero que prosperen ya que los rosales son complicados de mantener en este clima. Saludos! These David Austin roses are beautiful, indeed! Nadezda, I love David Austin roses so much, to have some of them in my garden is like a dream to me and they doing very well for now, they grow more and faster than my hybrid tea roses, it's a real pity you can't grow them there. Wish you a happy Easter too! Hello Marcelo, I’m surprised you can’t grow David Austin roses where you are, because they can be grown here! I only have one though- ‘The Prince’ which I grew from a cutting a friend gave me. It’s doing well. 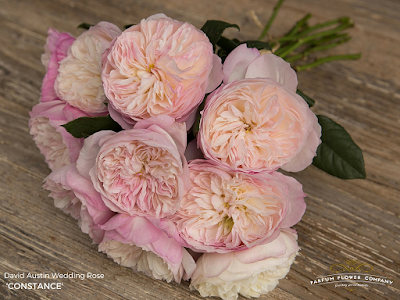 ‘Wedding Rose’ is glorious, but your roses are beautiful too. I hope you had a happy Easter. Jane, David Austin roses grow here, the normal cottage varieties but the ones I mention in this entry are only sold as cut flowers, they are not garden roses, but they are so gorgeous that I wish they were! Greetings! Oh! I see. I have a lot to learn about roses! One of the great things about blogging is learning from other gardeners. Your Mirabilis jalapa is a beauty. I grew it well one year, then it faded away the next; and to be honest I didn't try very hard to keep it because I was changing the arrangement of the plants. But now I think maybe I should grow it again... I've never seen it in those lovely, soft colors, only bright pink or pink/yellow.